There was a time when a primary concern for parents was too much exposure to television and how much was too much. Today parents are facing the same issues but within a different medium. How much is too much when it comes to the computer, tablets and the internet? With so many educational tools being developed within this cyber world is it reasonable to say that children should be limited to the use of these devices? Is information overload something that our children can experience and should we be concerned that over stimulation can be created when young children are introduced and encouraged to use these cyber spaces? 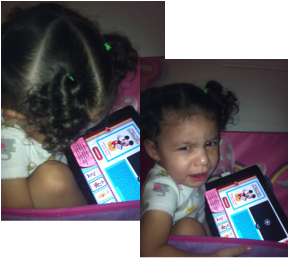 WIth Disney's Appisode features for the Ipad children are able to be physically interactive with the cartoon. They are forced to make decisions in order to progress through the story. If they choose incorrectly the progression of the episode is halted until they pick the correct item. One can argue that the effectiveness of the lesson is increased when children are able to interact with what is in front of them. On television the same program is seemingly less effective; children are asked the same questions but the program will move forward with or without the child's input. This may not make the program less enjoyable how ever the child is not learning through problem solving as exhibited in the previous video; instead they will learn through memory. Watching the same episode repeatedly will teach them what comes next. Some may argue that the child is learning through repetition in the appisode but in order to proceed they must first provide a physical action this makes the experience more memorable thus providing a more favorable method of teaching.